Raviram Ramakrishnan (Raviram VR) has been producing copper and brass sculptures for over twenty years. Born in 1973, he attended the Clarke School for the Deaf in Chennai due to his speech and hearing impairment. He discovered a love for art at age nine while watching his uncle, the late Sri P. V. Janakiraman, create metal sculptures. Despite being self-taught, he has gone on to create distinctive artworks that have won him recognition across India. He was awarded a scholarship from the Kanoria Center for Arts (Ahmedabad, 1999); a Tamil Nadu State Lalit Kala Academy Award (2001); and a Junior Fellowship of the HRD, Ministry of Tourism and Culture by the Government of India (New Delhi, 2002-2004). In addition, he participated in the National Exhibition of Art five times between 1998 and 2010 (New Delhi, Ahmedabad, Kochi, Bhopal, and Kolkata) and several charity art auctions. To date, he has held five solo exhibitions and his works are held in many private collections in India and abroad. 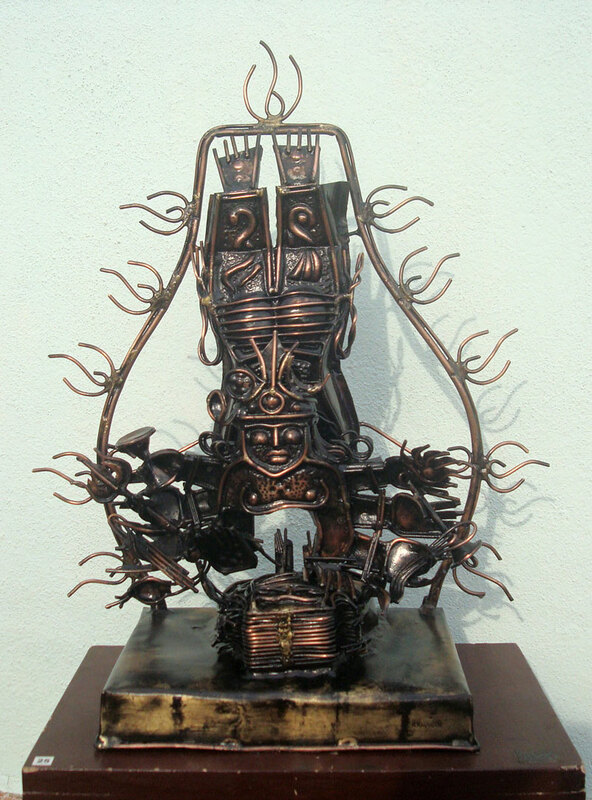 In his sculptures, Raviram animates copper and brass sheets and wires in the form of religious and mythological figures, animals, and natural imagery. He combines classical poses and compositions with abstract silhouettes and adornments. The result is a body of work that seems both historic and timeless--a modern iconography unique to the artist. His work can be found on his Facebook page and on his personal blog. Athreya. "Eloquent Metals." The Hindu, 10 May 2004. Elias, Esther. "Sculpting Diverse Stories." The Hindu, 24 July 2014. "Silent Strokes of Creative Splendour." Bangalore Mirror, 7 July 2013. Subramanian, Deepa. "Of Sounds and Silences - An exhibition of Copper Sculptures by Raviram Ramakrishnan." Galerie De’Arts, 30 July 2013.